Service & Repair . 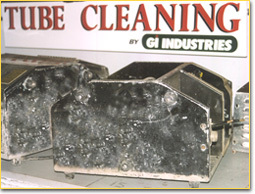 . .
GI Industries now services, repairs, and maintains tube cleaning machines. We currently service and maintain GI Industries and other Tube Cleaning machines. Below is a general list of servicing units for in-house service. Remember: Always replace your seals. It is the first item that can ruin a machine. SR-200 Total Tune-Up - diagnostics of machine. RS-03 Repair Mod - This modification virtually eliminates trigger jamming. What makes GI Industries better?